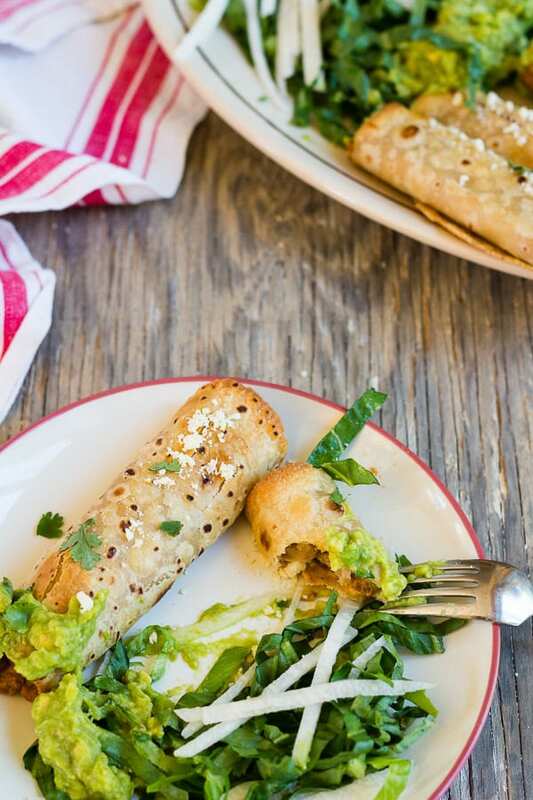 Yummy chile-spiced pinto beans rolled into soft tortillas, baked until good and crispy, and served with the easiest 2-ingredient guacamole you’ll ever meet—you are going to fall in love with these vegetarian baked taquito flautas with simple guacamole. 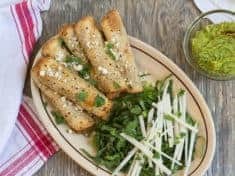 Taquitos flautas? Are you wondering why I gave this recipe two names that basically mean the same thing? Right, the distinction is subtle. And confusing, in that the differences dissolve depending on where you are in Mexico. Or Texas. Or California. Generally, taquitos are skinny fried tacos made with corn tortillas. Flautas, on the other hand are usually filled and fried flour tortillas, long and slim, like musical flutes. Flautas–Spanish for flutes—love that image! 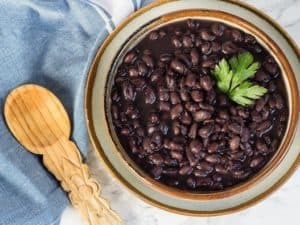 Spread a couple tablespoons of filling–nutritious fiber-rich cooked pinto beans mashed with chipotle pepper, onion, cilantro, and a bit of cheddar cheese–inside a softened tortilla. 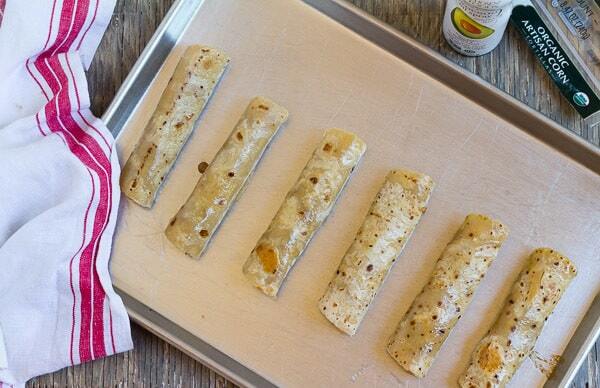 Fold over and roll up like you would a rug, spray the rolls with healthy cooking spray, and then bake into crunchy spicy meatless taquito flautas. Baked, not fried–much better for us! While the filled rollups bake, mush avocado and purchased green salsa into guacamole. Two ingredients, three minutes. Easy-tasty. 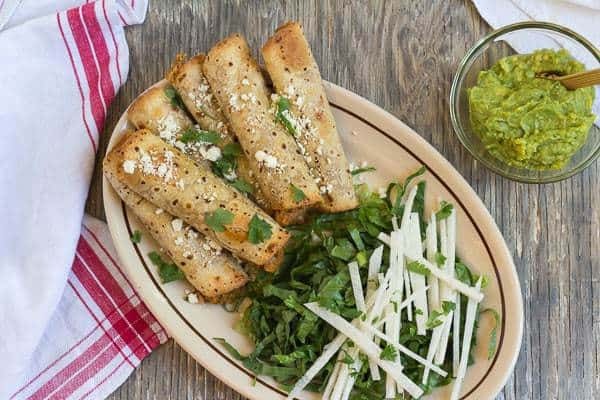 Serve your crispy baked taquito flautas with simple guacamole and shredded lettuce, as appetizers or a light supper. They are plenty sturdy for travel—I tucked them in a Tupperware container to share at an outdoor summer concert not too long ago. Serve with refreshing Ginger Beer Mexican Mules, with or without tequila. I started out naming them flautas, but then wavered, thinking you–more people–would know these skinny Mexican snacks as taquitos. The double-barreled name came when I accidentally picked up Mi Rancho’s organic artisan corn tortillas, thinking I was buying pure corn tortillas. Whoops! Mi Rancho’s “artisan” tortillas are made with both corn and wheat–they are perfect for taquito flautas! The easiest way to soften your tortillas for rolling is spray them with cooking spray and pop in the oven for a minute, like for chard enchiladas. Alternatively, brush the tortillas lightly with avocado or olive oil. Make these vegan: Omit the cheese. For baking spray, I’ve converted to Chosen Foods avocado spray instead of canola oil spray. There is no comparison in flavor and quality. Plus, I’ve been reading about canola oil and am steering away from it. Definitely avocado oil is a healthier oil. You can also use a quality olive oil spray. 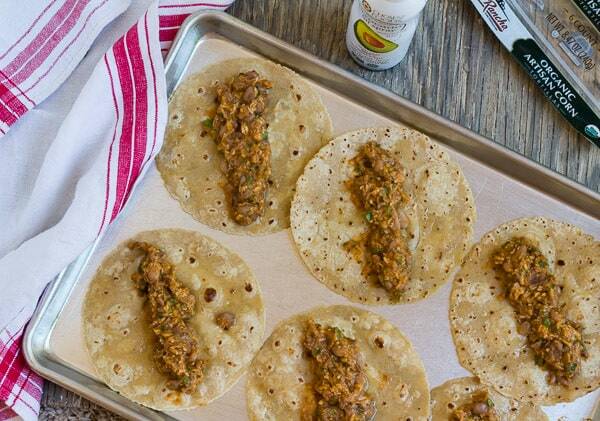 I make these super easy with canned pinto beans, cooking spray, and purchased salsa verde. If you’re planning ahead (so rarely me), cook your beans and salsa verde from scratch. Make it a fabulous week–get in the kitchen and cook something quick and easy! For more vegetarian recipe ideas, peruse my Pinterest boards. 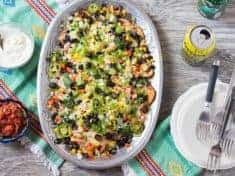 I save Mexican recipes here. These baked vegetarian snacks are a fun appetizer! For a light supper, serve 3 or 4 taquito flautas with the lettuce salad. Makes 8 taquito flautas. Preheat oven to 400°F. Heat oil on medium flame in a medium skillet. Sauté until onion is soft, about 5 minutes. Stir in the beans, chipotle pepper, cheese, and cilantro. Using a potato masher or fork, mash the mix so the beans are broken down into a spreadable mix. It’s ok if the beans aren’t completely mashed. Lightly spray both sides of the tortillas with avocado spray and arrange on baking sheets. Heat in the oven just until they are pliable, 3 to 5 minutes. 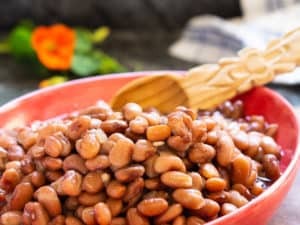 Spread 2 to 3 tablespoons of the bean mixture down the middle of a softened tortilla, leaving about 1-inch on either end. Starting with the edge closest to you, roll the tortilla as tightly as possible. lay on the baking sheet seam side down. Lightly spray with the avocado oil. Bake 15 to 20 minutes, until the edges are golden brown and a bit crispy. They will get crisper as they cool. While the taquito flautas are baking, make the guacamole. 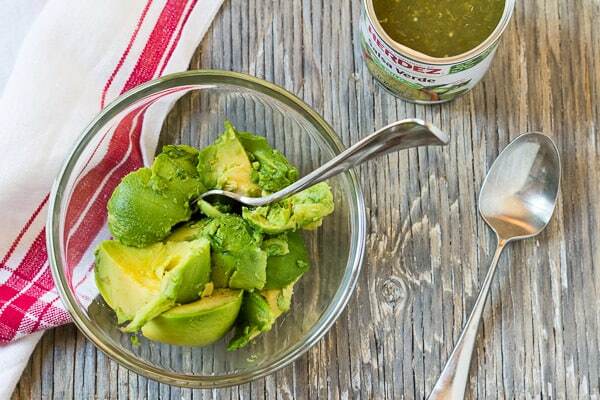 Mash the avocado with enough salsa verde to make a spreadable guacamole. Arrange the shredded lettuce with jicama and radish on a platter alongside the taquito flautas. Serve with guacamole. 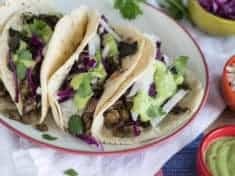 •For chipotle oil, puree a 7-ounce can of chipotle chiles in adobo sauce in a blender with avocado or olive oil until smooth, adding a bit more oil, if needed, for a smooth paste. Keep in a small container in the freezer and use as needed. • Mi Rancho’s artisan corn and wheat mixed tortillas roll quite tightly and stay rolled very well. If you can’t find them, use a quality corn or a quality wheat flour tortilla. When softened with cooking spray, corn tortillas roll up fine—hold with a toothpick if they try to unwind.